Hint: It’s a movie. I’ll take the title or the director’s name to be a correct answer. You have until Wednesday the 7th to enter your guesses, at which time I’ll put the names of all those who got it right into a hat and select a winner. What’s on the line? Something tasty from the Blue Garter stash, of course! Since I can’t seem to stop adding to it, I figure I’d better spread the love around to my loyal readers now and then. And secondly, the epic project reveal. The winter before last, we lost Cousin Saucy, as my branch of the family always called my mother’s cousin Sandra. She went in for a knee-replacement surgery, and during her recovery a blood clot went to her brain and left her in a coma from which there was no chance of recovery. We had to let her go. Last year’s trip up into the San Juan Mountains in Colorado was our memorial to her, and we left her ashes at the mouth of her father’s silver mine. Saucy and I had a kinship of the mind and soul, not just of genes, and she was a big influence on my young life. She was a horsewoman, a farmwife, an archaeologist, an advocate for the rights of Native Americans, a bookworm, a historian, and, as it turns out, a knitter. According to her sister, she didn’t do much knitting after her sons were born, which was back around 1970. But she kept a stash of yarn, and I inherited a load of it. I’ll never know what Saucy intended to knit with this wool, but I think she’d be deeply tickled by this project. We never did get to go pony trekking in the Scottish highlands together (although she did go with her son), but she loved the country and would certainly have approved of an historical Fair Isle recreation. It’s hard to imagine she wouldn’t have had something like this up her sleeve, since the colors are so exactly appropriate. And Scotland may well have been on her mind in the latter half of the ’60s, as our mutual favorite historical novels by Dorothy Dunnett were being published. It’s all I can do not to cast on a swatch cap right now, but I must be disciplined and finish my Shibui sweater first. And since the Quintessential Fair Isle may top out the list of my most Meaningful Handknits, being sort of sacred to the memory of someone I loved, one really mustn’t rush it anyway. Uh…. Um… It’s a cute pumpkin, but I obviously don’t see nearly enough movies, because the only thing that’s coming to mind is Home Alone. I swear, I haven’t even seen that movie, and I really am a (marginally) cool person. I was going to say Princess Mononoke as well. Super cute! I loved those little sprite-like fellows. Your project sounds deeply moving and looks to be beautiful. What a moving tribute. De-lurking to say; It looks like the Kodama from Princess Mononoke, as several people have already stated, film by Hayao Miyazaki. excellent choice, by the way, they seem perfect for a pumpkin! What a tragedy for you and your family it must be to lose such a great spirit early. It is going to be a wonderful project. Thank you for sharing the meaning behind your project, I’m sure she would have loved it. i think princess mononoke too! The pumpkin is from a Hiyao Miyazaki film! It’s totally cute. Good luck with the sweater- it looks like the perfect tribute. Additionally, did you post on my blog a few days ago, about the Bike meetings in Portland? I think I bought the yarn for my Minimalist sweater from you at Knit/Purl… if those were both you, thanks! And hi! wow, look at all those votes for Princess Mononoke! That was(is) totally my vote before I even saw the comments! yep, kodamas from princess mononoke. director hayao miyazaki. love him. what a gorgeous and ambitious project! i can’t wait to see it come together. I don’t know who princess mononoke is 🙁 But the pumpkin is cute! And good golly, that’s quite an ambitious sweater. But I know that you’ll handle it with grace, as always. Yes, it’s definitely Princess Mononoke. Love that film! And love pumpkins! The sweater looks like a really great project! is it a recent movie? all i can think is halloween, lol. What a wonderful tribute! There’s nothing like vintage designs. definitely a kodama pumpkin 🙂 have you seen spirited away? definitely a kodama pumpkin – princess mononoke by hiyao miyazaki:) have you seen spirited away? Mr. Garter did a wonderful job with the photos! How about that. I need to take an adult ed class to get my camera to work properly for me – I have tried to go outside in the sunshine, but can’t even figure out how to turn the flash OFF. Your Aunt Saucy’s stash will make a beautiful sweater for you, and I’m sure you will feel connected as you knit it, and each time you wear it. I’m happy to hear that I’m not the only one who hadn’t heard of Princess Mononok or Hayao Miyazaki, I was going to say Tim Burton’s Nightmare Before Christmas. Its cute, regardless! i’m so excited for your project. what a wonderful tribute to a woman who clearly meant so much to you. i’m sure she’d be thrilled that you’ll tackle such an ambitious project! 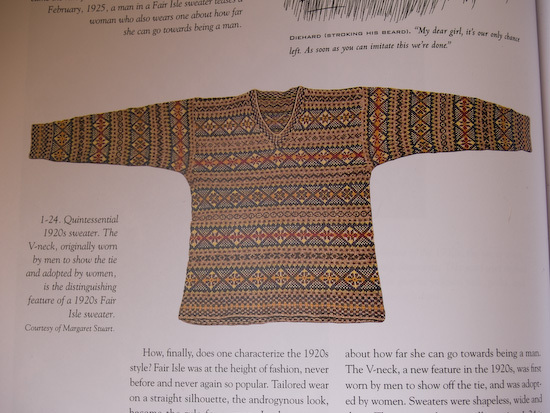 Now, that is an ambitious Fair Isle sweater! But a perfect project for yarn with a history. I’m sure you’ll cherish every stitch. when I first saw it to made me think of Casper immediately. The 1995 movie was director by Brad Silberling. I hope I’m right. What a stunning project! 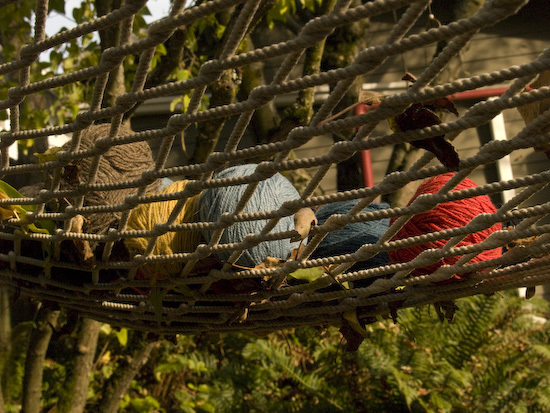 All of it is so full of meaning – the yarn, the inspiration. A true tribute! Being a Norwegian I immediately recognized Munch’s “The Scream”. (And I see that I have Suzie with me on this!). 3 tr is indeed 3-ply. 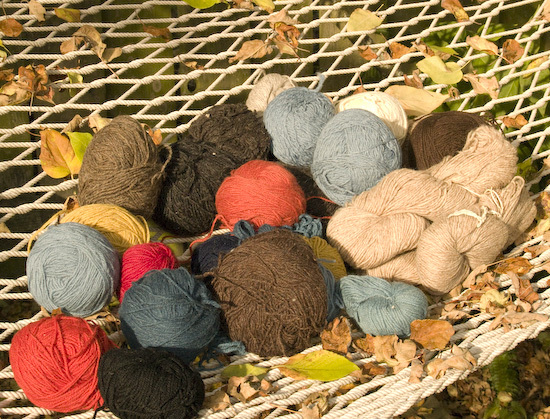 Raumagarn is a traditional Norwegian yarn, on the slightly scratchy side but it comes in all sorts of colors. It must be wonderful to receive this yarn in these colors your aunt had chosen years ago! The colors are so approbriate for the sweater, they seem to be so very Scottish; skies, waters, heaths and moors. Are you going to make the sweater “shapeless and wide?” – I’m intrigued by the text next to the sweater! What a wonderful way to use that special yarn- that’s going be one fabulous sweater indeed! You have the best artsy photography. It will be a glory of a sweater. 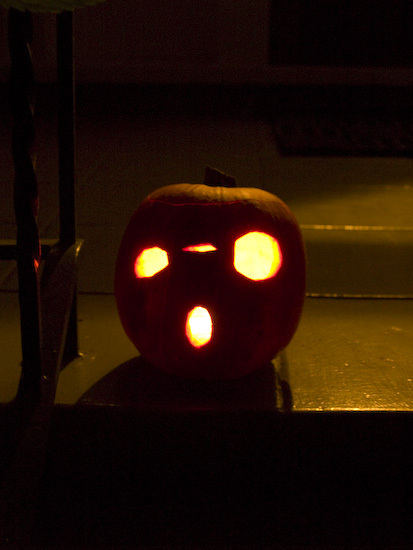 As for the pumpkin. To me, I see a kodama from Princess Mononoke. Maybe I’ll watch that again this week. its definately those cute little ghost from Princess Mononoke, directed by Hayao Miyazaki. This will certainly give away my age/generation, but my first thought was E.T. 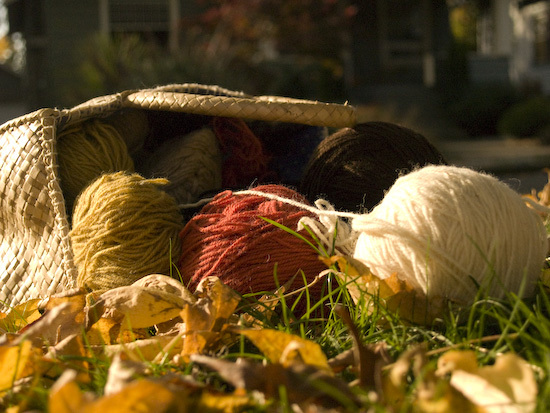 You know, “Phone home!” The yarn you inherited is lovely and the stories behind it makes it all the more special. 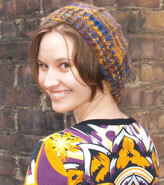 The Fair Isle sweater is perfect and will look lovely on you! Thank you again for meeting up with me on Friday. You are just as charming, fun, and intelligent as I knew you would be. I hope we’ll meet again some day! I am very excited about your sweater project! It will be stunning. I can’t wait to see how you make it come together. Nice tribute, and nice photos! See, and I saw it and thought vaguely Nightmare before Christmas-sy. But it doesn’t help that I’ve never heard of this Princess Mononoke thing before. oh inheriting wool. when my mother died at 56 she had a project in the making. that is knitting for me. and you inherited wool. how great is that. you will whip off a beautiful project in no time. Oh the Scottish Highlands are beautiful. Hopefully one day you’ll be able to make it there for your pony trekking (Aunt in memory, of course.) Nestled in the Scottish mountains there’s a great little town called Firbush on Loch Tay that is beautiful. Keep that in mind!